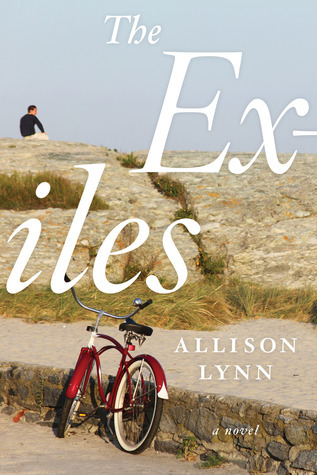 Thanks to TLC Book Tours, we're pleased to present a review for The Exiles, a new contemporary fiction novel by Allison Lynn. Make sure to check out the rest of the tour stops to see other reviews! A couple escaping the opulent lifestyle of Manhattan’s Upper East Side move to Newport, Rhode Island, only to be confronted by the trappings of the life they tried to leave behind. Nate, a midlevel Wall Streeter, and his longtime girlfriend Emily are effectively evicted from New York City when they find they can no longer afford their apartment. An out presents itself in the form of a job offer for Nate in Newport—complete with a bucolic, small, and comparatively affordable new house. Eager to start fresh, they flee city life with their worldly goods packed tightly in their Jeep Cherokee. Yet within minutes of arriving in Rhode Island, their car and belongings are stolen, and they're left with nothing but the keys to an empty house and their bawling 10-month-old son. Over the three-day weekend that follows, as Emily and Nate watch their meager pile of cash dwindle and tensions increase, the secrets they kept from each other in the city emerge, threatening to destroy their hope for a shared future. A story about losing it all, the complexities of family histories, tainted gene pools, art theft, architecture, and the mad grab for the American Dream, The Exiles bravely explores the weight of our pasts—and whether or not it's truly possible to start over. I feel like the summary above only skims the surface of what happens in The Exiles. Like, the bulk of the summary are things that happen within the first few pages. The rest of the book is really that tiny little third paragraph, Nate and Emily dealing with their own issues, and some family issues, and the fact that they're both secret keeper extraordinaires, and not in the cool Harry Potter secret keeper sort of way. A lot of what drives Nate and Emily is their angst over not having enough money in New York. It absolutely consumes them, and they drive themselves into stress and a lot of debt just trying to keep up with their wealthy friends. On some levels, I get this; money is a huge motivating factor and it can be easy to obsess over, especially when the people you surround yourself with have much more than you do. But I hate it when people make New York out to be this mythical playground that only the uber-rich can afford. I have plenty of friends living there on very modest salaries and they love it and make it work. I even have a friend/acquaintance who has lived in Manhattan on $1,000 a month. She's even writing a book about it. Is it the same lifestyle that Nate and Emily's wealthy friends have? No, but she has fun and has amazing experiences and lives a very full life and is probably much more personally fulfilled than these two were. I just had such a hard time identifying with them or feeling any sympathy for them and their very narrow, elitist world view. I'm like, dude, move to Brooklyn or Queens or Washington Heights or something, your life does not start and end with gigantic high rises on Park Avenue. Not every book needs to have likeable characters who make smart decisions all the time; that would be boring. The Exiles features a cast of terribly unlikeable people whose catastrophic decision making nearly ruins them. Like I said, Nate and Emily are hard to sympathize with, which made me roll my eyes a lot as I was reading the book. Their problems are almost entirely of their own making, and their lack of ability to communicate with one another about important things is super frustrating. They're both nearing 40 and haven't figured any of this out yet. Proving that this phenomenon isn't isolated only to YA books, I spent a lot of time wanting to reach into the book, shake them, and tell them to use their words. Or, at the very least, get them referrals to some therapists and psychiatrists and real medical professionals instead of letting them stew in their own angst and assumptions. I enjoyed the book but I've got to admit that one of my main motivating factors for getting to the end was waiting to see who would snap first. That said, I thought this book was a great character study of all the characters involved, which is what made this a worthwhile read for me. While their start in Newport is rocky, with lies and accusations and theft and illness overwhelming them, by the end of the book you have a glimmer of hope that Nate and Emily will get their act together in the future. And in the meantime, you get to see what happens when a whole lot of stress piles up on two people and essentially breaks them. It's fascinating, and a little bit sad, with a few laugh out loud moments to lighten things up along the way. It was! It definitely made me think a lot, even if I felt kind of iffy about the characters. I don't think I'd like this couple if I met them in person but their story certainly seems like one that would draw me in. That's pretty much how I felt - they would have been really frustrating to have in my life, but I kept wanting to know what was going to happen next to them.